I've gotten a few of these emails and they make me laugh, because I actually CAN'T WAIT to switch from my OneTouch UltraLink. The ONLY think I like about it is that it links to my pump. I saw the new Bayer Link meter (supposedly coming in "the Fall") at Friends for Life and I really really really can't wait until it's available. It's small, it's rechargeable (USB, baby), its screen is back-lit, and the port where the strip goes also had a light. Bring. It. On. HEARD. I actually made my switch to the VerioIQ because I was just. so. sick. of my UltraLink. Horribly uneven results, nothing matched, etc etc. That being said, the Verio hasn't been flawless...and I TOTALLY underestimated how annoying entering all of my BGs in the pump was going to be. Maybe I'll be making the switch with you in "the Fall"! I've got my Bayer Contour Link on order, and have for some time. I can't wait for it! Less blood, plus I think I've just become bored with the same OneTouch Ultra I've used for the better part of a decade. I never got one of those emails though. 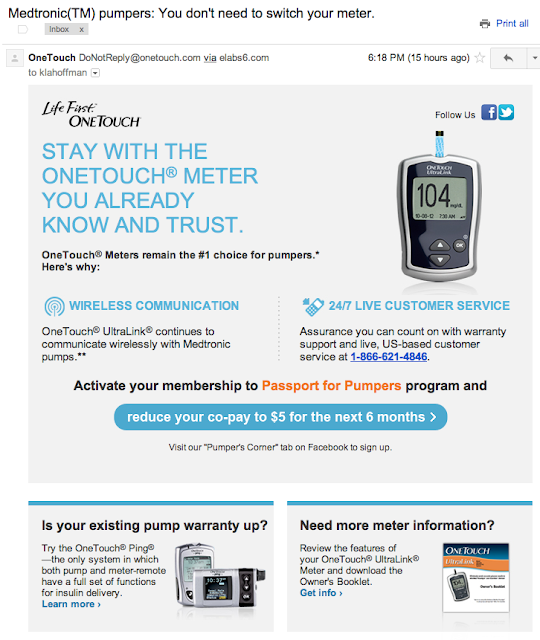 (side note: a few months ago, Bayer announced they were selling their diabetes division... possibly to OneTouch!). My UltraLink was absolute nonsense towards the end of my usage. I go back and forth between the Verio and the Ping now.